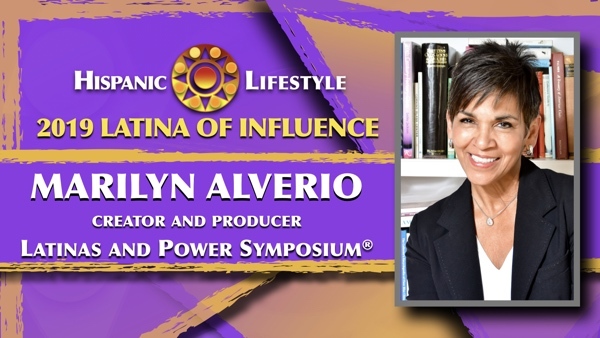 Hispanic Lifestyle is pleased to recognize Marilyn Alverio creator and producer of the Latinas and Power Symposium® as a 2019 Latina of Influence. Ms. Alverio along with our entire list of 2019 Latinas of Influence are invited to participate in Latina Conference 2019 taking place April 10 and 11, 2019 in Ontario, California. Having grown up in an urban neighborhood Marilyn learned early on about the impact of giving back to the community, volunteerism and paying it forward. Her parents migrated to the U.S. from Puerto Rico in the early 1950’s and instilled the importance of “la Familia,” culture, our language and being involved in “La Communidad.” She earned her B.A from the University of CT. in Storrs, CT and later an M.B.A. from the University of Phoenix. Marilyn has worked in the corporate arena for more than twenty five years where she has held numerous management positions within the airlines, pharmaceutical, education, financial and health insurance industries. As an entrepreneur, she founded Ethnic Marketing Solutions, an agency that focused on strategic marketing for companies interested in learning about and tapping into multicultural markets. During her stint at Aetna Inc., she was the national director for Ethnic Markets, At MassMutual; Marilyn held a director level position for a digital start up called ValoraLife. Her responsibility included developing strategy and execution of an end to end digital life insurance product focusing on the U.S. Latino population. Currently, Marilyn is on the marketing team in the Workplace Solutions division that focuses on retirement services. Her most recent success as creator and producer of the Latinas and Power Symposium® (LPS), is achieving national recognition and will celebrate its 16th annual conference on May 16, 2019 in Hartford, CT. The annual one-day inspirational event is a leadership and professional development platform designed for the Latina on a career or business path. It offers networking, camaraderie, workshops, inspirational speakers and numerous opportunities for sharing strategies for success. Latinas and Power Corp. has become a 501 C 3 that will focus on building a virtual Latina Leadership Institute in the Northeast. Marilyn is the CEO of this endeavor. Marilyn’s has served on many diverse boards including: Connecticut Health Foundations, Spanish American Merchants Association (SAMA), United Way of Greater Hartford and the University of Connecticut Advisory board. Currently, she is a member of the University of Hartford’s Presidents advisory board. Hello! I’d like to nominate Marilyn Alverio, corporate marketing specialist, ethnic marketing consultant, and the founder of LATINAS & POWER Symposium, for your LATINAS OF INFLUENCE Award. She is a dynamo that has influenced hundreds of Latinas in New England and beyond. As a successful businesswoman in the corporate sector, she believe it is her responsibility to guide the next generation of Latina leaders with her symposia and other endeavors. I admire her greatly and you will love her as much as I do!